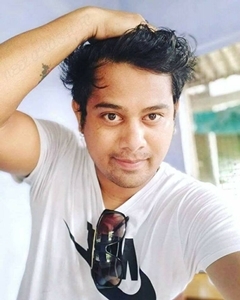 Neel Akash is an Indian singer, composer, songwriter and actor from Assam. His contributionsare mostly attributed in Assamese, Adibasi. In 2016, he released his first solo album namely “BIHUWAN”.His hit track "Sakuntala" from "Bihuwan (2016)" viewed over than 10Lakhs on YouTube. Neel Akash has been performing numerous shows in Assam during the Bihu season. Apart from singing, he is a very stylish guy. Though he is originally from a very small place, but he always keep him stylish.